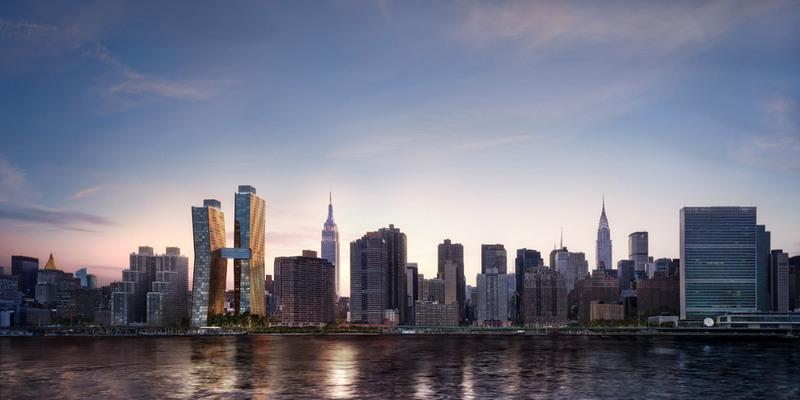 Called the American Copper Buildings – and formerly known as 626 First Avenue – the 41- and 48-storey residential towers are rising on First Avenue and 36th Street on the eastern edge of Manhattan. 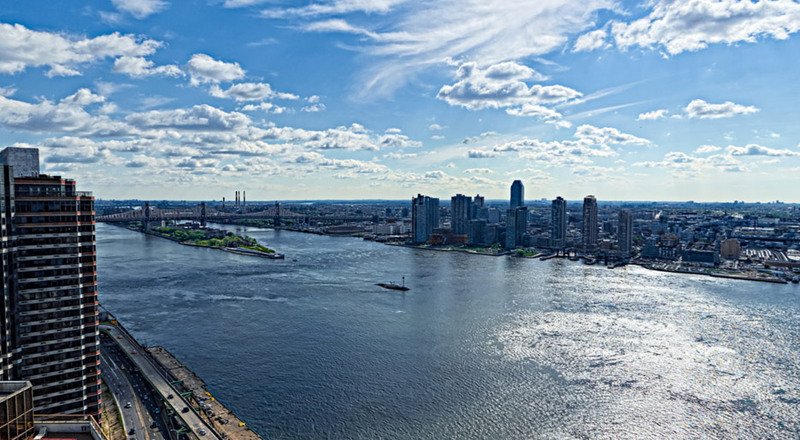 The waterfront site overlooks the East River. The upper half of the skyscrapers bend slightly outward, drawing references by the local media to the Leaning Tower of Pisa. The firm has described them as "dancing" towers. At floors 27 to 29 – the point where the buildings nearly touch – the towers are linked by a skybridge suspended 300 feet (91 metres) above the ground. 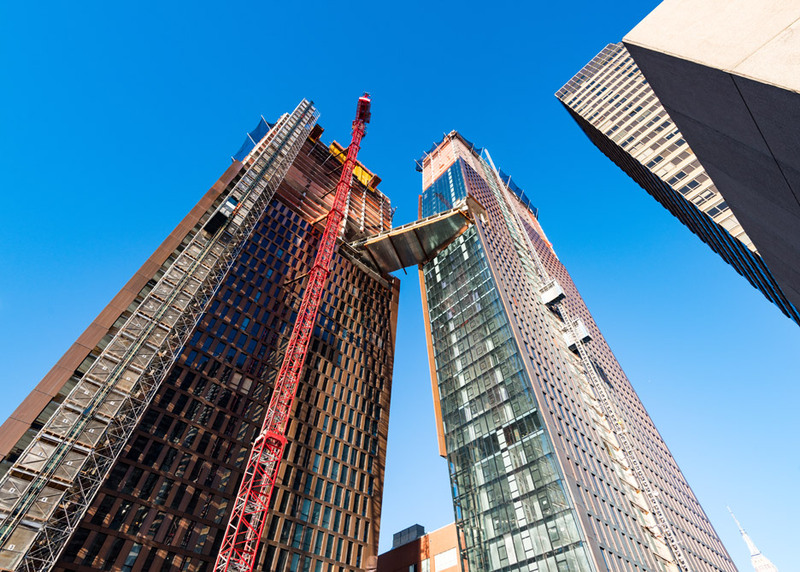 It is the first major new skybridge to be built in New York in nearly 80 years, according to the project team. 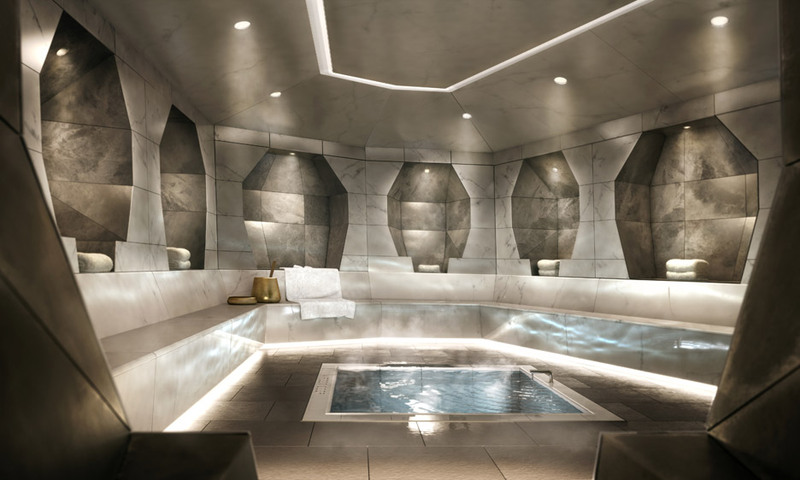 Supported by steel trusses, the three-storey bridge will contain a 75-foot-long (23-metre) lap pool, a hot tub, a bar and a lounge. "The public gathering space for the two buildings happens across the bridge," SHoP cofounder Gregg Pasquarelli told Dezeen. 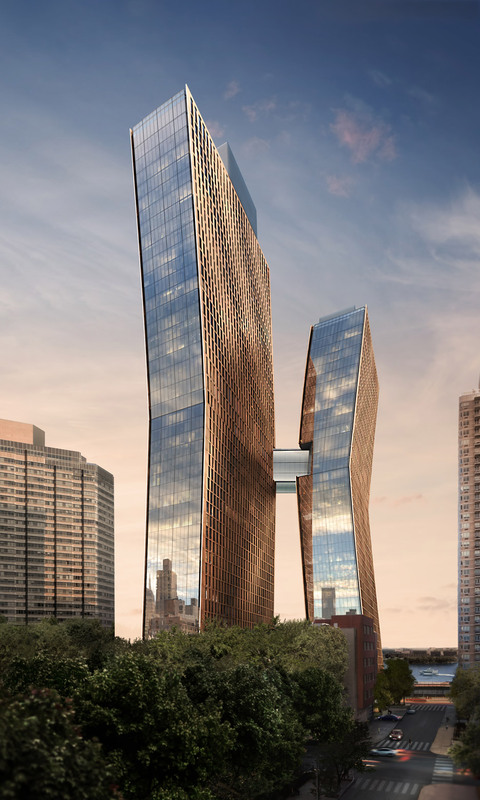 As their name indicates, the towers will be sheathed in copper panels, which are intended to develop a green patina over time. 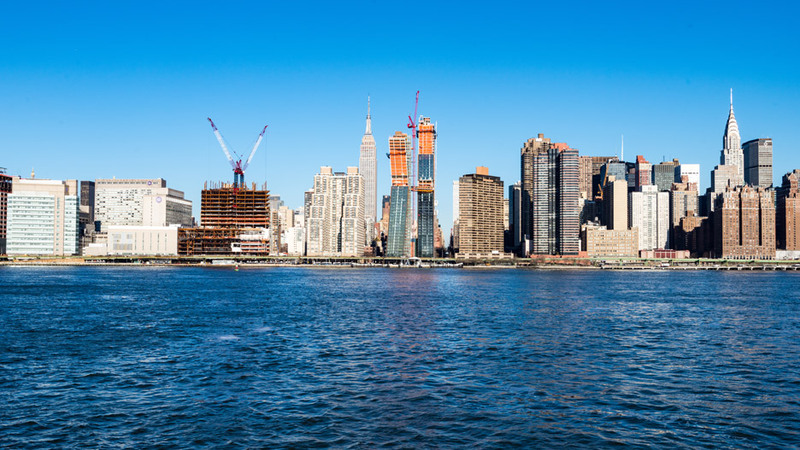 SHoP – known for its use of raw materials such as zinc and weathered steel – took cues from New York's iconic Statue of Liberty in conceiving the towers' cladding. "It's almost like a performance piece," Pasquarelli said of the project. "It started as a shiny penny, and it's already turned to a rich brown colour. 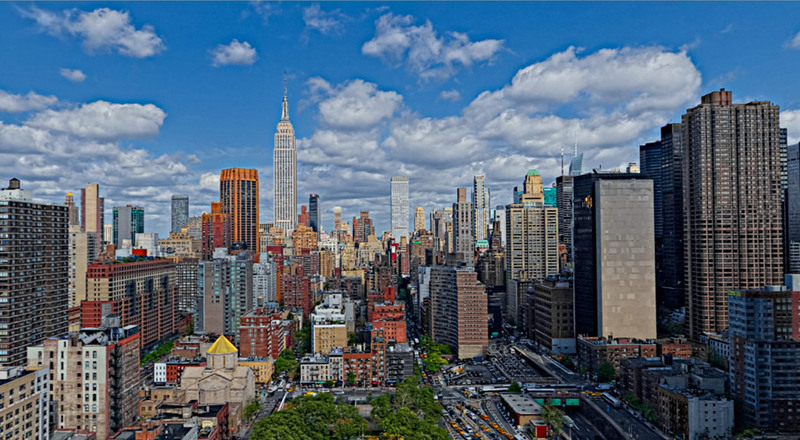 Over the coming decades, the buildings will turn green like the Statue of Liberty." The towers' form was driven by the firm's desire to be creative with limited site conditions. "It was a fairly banal zoning envelope," Pasquarelli told Dezeen. "We said, what can we do inside of that? Let's take the standard floor plate, which is super efficient and works really well, and let's see how far we can take it." From the base to the skybridge, one side of each tower slopes outward approximately four degrees per floor. From the skybridge to the roofline, the towers bend back in the opposite direction, also with a slope of four degrees per floor. 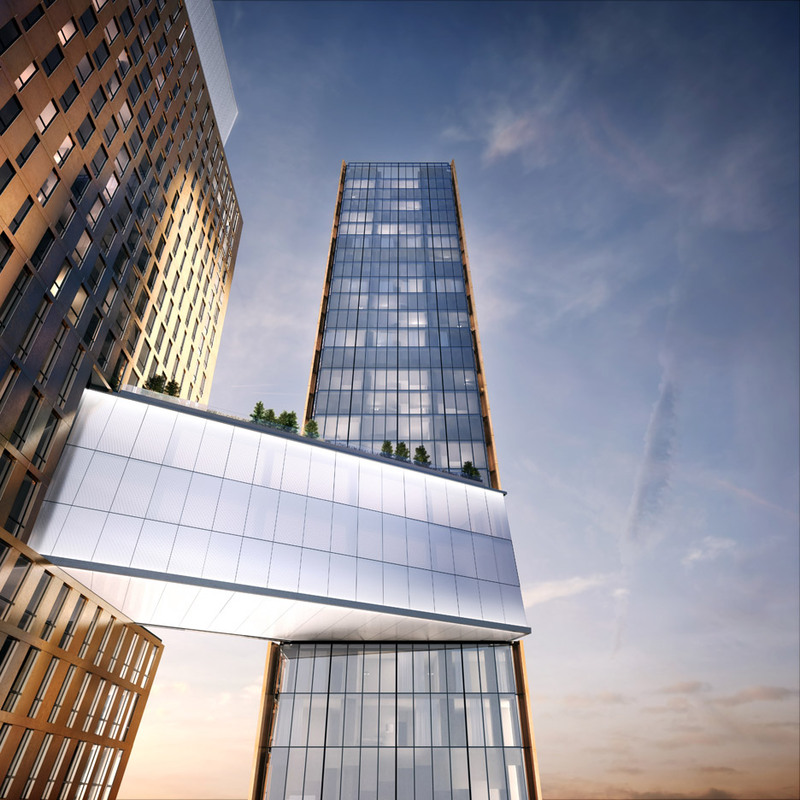 Beyond the tenant amenities in the skybridge, the project will offer a double-height fitness centre with a climbing wall, a juice bar, a children's playroom, a Turkish-style spa and a rooftop infinity pool. Combined, the towers contain 761 rental units, ranging from studios to one-bedroom apartments. Of that total, 150 units are designated as affordable. 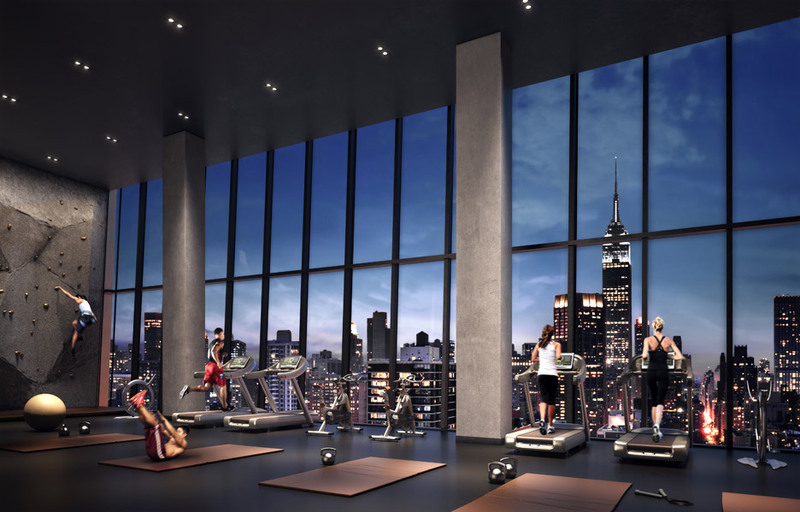 "Each tower offers over 300 one-of-a-kind layouts with sweeping, enviable views of the Empire State Building, East River and Manhattan skyline," said the project team. 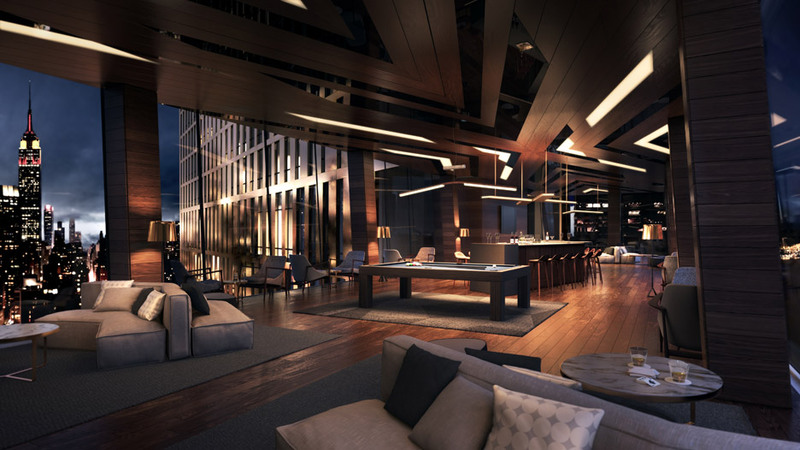 A porte-cochere will lead into lobbies with ceiling heights reaching 25 feet (7.6 metres). The site will feature a park and fountain, with landscape design by the local studio Scape. 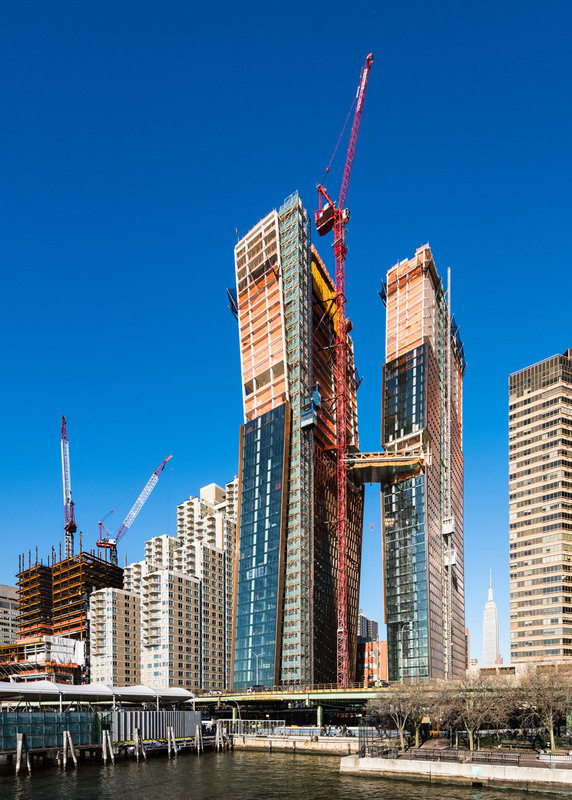 The towers are being constructed on a site that flooded during Hurricane Sandy in 2012. Various measures have been taken to protect the buildings in the case of a major weather event, such as placing mechanical systems on the second floor. The full project encompasses 900,000 square feet (83,600 square meters). Apartment leasing will begin this fall, with completion of the project scheduled for 2017. JDS Development Group is backing the project. This is SHoP's fifth project with JDS. 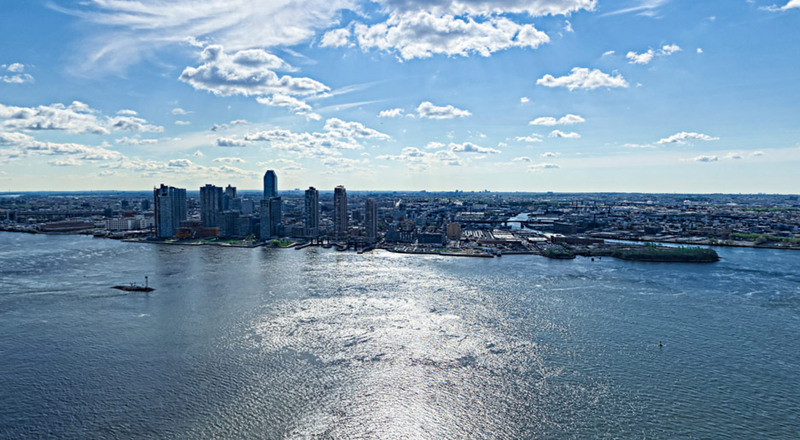 New York is currently experiencing a boom in high-end residential towers, ranging from a skinny skyscraper by Foster + Partners to a rash of supertall towers that sparked protests last fall due to the long shadows they cast over Central Park. 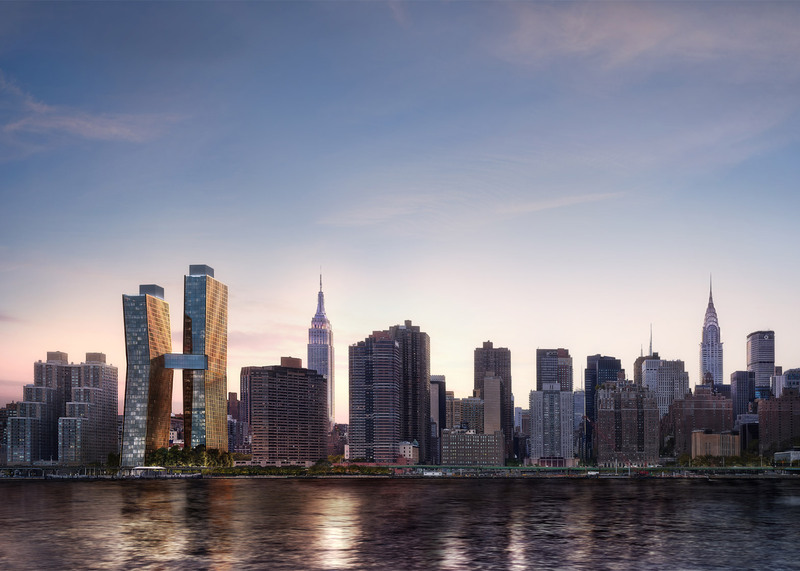 SHoP has designed two supertall towers for the city: 111 West 57th Street in Manhattan, which is currently under construction, and 9 DeKalb Avenue in Brooklyn, which just received the green light from New York's Landmarks Preservation Commission.